Here are five examples of deadly incidents that were caused by dust, and ways businesses can eliminate the risk of a dust explosion happening in their facility. In February 1999, a deadly fire and explosion occurred in a foundry in Massachusetts killing 3 and injuring 9. A fire initiated in a shell molding machine from an unknown source and then extended into the ventilation system ducts by feeding on heavy deposits of phenol formaldehyde resin dust. A small primary deflagration occurred within the ductwork, dislodging dust that had settled on the exterior of the ducts. The ensuing dust cloud provided fuel for a secondary explosion which was powerful enough to lift the roof and cause wall failures. In January 2003, devastating fires and explosions destroyed a North Carolina pharmaceutical plant that manufactured rubber drug-delivery components. Six employees were killed and 38 people injured. An accumulation of a combustible polyethylene dust above the suspended ceilings fueled the explosion. The CSB was unable to determine what ignited the initial fire or how the dust was dispersed to create the explosive cloud in the hidden ceiling space. In February 2003, a Kentucky acoustics insulation manufacturing plant was the site of a dust explosion killing 7 and injuring 37 employees. The likely ignition scenario was a small fire extending from an unattended oven which ignited a dust cloud created by nearby line cleaning. This was followed by a deadly cascade of dust explosions throughout the plant. In October 2003, an Indiana plant where aluminum auto wheels were machined experienced an incident which killed one and injured one employee. Aluminum dust was involved in a primary explosion near a chip melting furnace, followed by a secondary blast in dust collection equipment. February 10, 2008 a deadly explosion ripped through a sugar refinery blast killing at least 6 workers and sent 62 to the hospital. “As far as we know it was a sugar dust explosion,” authorities said the day after the explosion. The blast occurred in a storage silo where refined sugar is stored until it is packaged. Sugar dust is combustible. Static electricity sparks from metal tools, or a cigarette can ignite explosions. A dust cloud (diffused fuel) is ignited within a confined or semi-confined vessel, area, or building, and burns very rapidly or explodes. The safety of employees is threatened by the ensuing fires, additional explosions, flying debris, and collapsing building components. An initial explosion in an area were fugitive dust has accumulated may shake loose more accumulated dust, or damage a containment system (such as a duct, vessel, or collector). As a result, if ignited, the additional dust dispersed into the air may cause one or more secondary explosions. These can be far more destructive than a primary explosion due to the increased quantity and concentration of dispersed combustible dust. What action can employers take to reduce their exposure? If one of the elements of the explosion pentagon is missing, a catastrophic explosion can not occur. 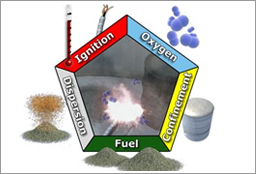 Two of the elements in the explosion pentagon are difficult to eliminate: oxygen (within air), and confinement of the dust cloud (within processes or buildings). However, the other three elements of the pentagon can be controlled to a significant extent.